Mothersday is coming up soon, so why not enter our April competition and stand a chance to win a marvelous gift set for you & mom. 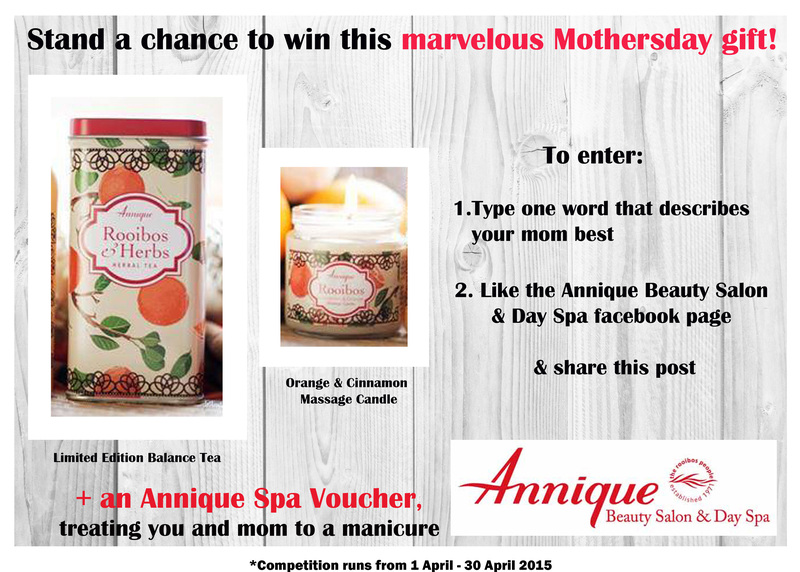 The gift consists of an Orange & Cinnamon Massage Candle, a Limited Edition Balance Tea in a vintage gifting Tin as well as an Annique spa voucher, treating you and mom to a manicure! All you have to do to enter is “like” the Annique Beauty Salon & Day Spa Facebook page and “share” the competition post. While you’re there, name one word that describes your mom best! The competition runs from 1 April – 30 April 2015 and the winner will be announced on 1 May 2015.